This delicious, succulent chicken served with a green sauce similar to a creamy chimichurri is a sure crowd pleaser. This version is a loose adaptation of J. Kenji Lopez-Alt’s grilled recipe featured on his blog Serious Eats. While it could also work out quite nicely on the grill, this version is executed in the kitchen and is one of the best things I’ve made in a long time. Begin by brining your chicken. In a large bowl, mix together 6 cups cold water and 1/4 cup kosher salt. Whisk until salt is dissolved. Add chicken and refrigerate for at least 30 minutes, or up to two hours. Combine dry spice rub ingredients (ingredients 2-6) in a bowl or tupperware container and whisk or shake vigorously to combine. Combine all ingredients in a food processor or blender and blend until smooth. Pour into appropriately sized container and refrigerate. Remove the chicken from the brine and pat dry with paper towels. In a large tossing bowl, add 2 TBSP olive oil and 2 TBSP white wine vinegar and toss to coat. Add 1/2 of dry spice mix and toss to coat again. Add remaining spice mix and toss to coat a third time. Place half of chicken, skin side down, into the skillet and brown for 4-5 minutes, or until golden brown. Flip chicken over and brown 2-3 minutes more. Remove from pan and set on a wire rack placed on a rimmed baking sheet. Repeat with remaining chicken. You should have a nice fond in the bottom of your pan. Add onion or shallot to pan and sweat until very fragrant, 3-4 minutes, and some of the fond begins to incorporate into the onion. Add garlic and sauté until fragrant but not burned, 1 minute more. 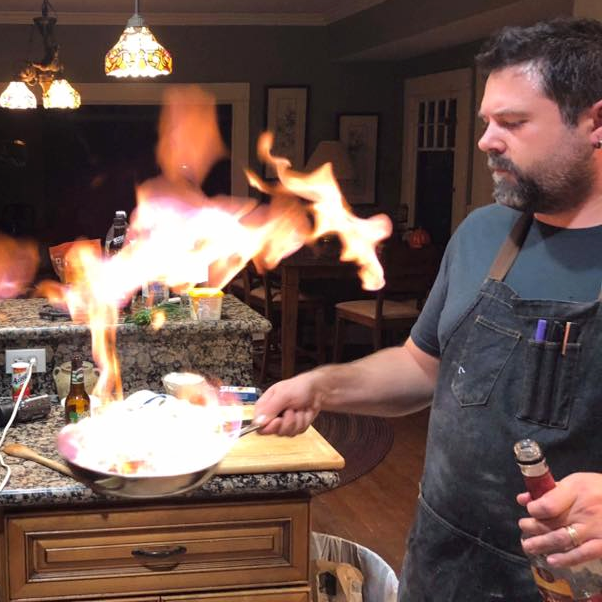 Add vermouth and flambé. Bring to a boil and scrape up any brown bits still stuck to the bottom of the pan. Reduce sauce to an almost syrup-like consistency, and then baste chicken using a spoon. Remove from oven, place on a serving platter, and squeeze lemon juice all over chicken. Let rest for 10 minutes. Spoon green sauce over chicken and serve. Note: I served this with some garlic toast and a bacon-avocado Caesar Salad, using the bacon bits from which I rendered the fat in Step 3 of the cooking process. It was delicious.